We’ve decided to start our new venture and become farmers. So, during the spring of 2008, we bought 26 chickens and 2 Giant White Turkeys. Luckily, we ended up with 1 tom and 1 hen turkey. So we decided to keep them instead of butchering them. We were hoping to get turkey eggs in the spring. Last week my wife called me at work and said our oldest son thinks the hen turkey is dead. Since I only work a couple of blocks from home I went to check it out. When I saw the hen I thought ‘how could you think she was dead.’ She was on her back, feet in the air, not moving. She IS dead. I don’t know what she died of, but when she was younger she was having trouble walking around and ended up with a severe wobble. I think she gained too much weight when she was younger and her legs didn’t grow strong enough. After she passed I weighed her. She was 30 pounds. Needless to say, we won’t be having turkey eggs. As far as our tom goes, He would strut around the brooder when he was very young. He is always hungry and does not care what is in his way. He plows through and steps on any chicken just to get to the food. Most of the time he is puffed up and strutting around. Last week he attacked our youngest son who is almost 3. That was a deal breaker for the wife. With his girlfriend gone and him attacking the kids, not to mention the amount of food we go through, we had decided to have him for Easter. However, the wife wants to wait and use him for ground turkey meat instead. Since he weighs in at 51 pounds, I think that’s a great idea. 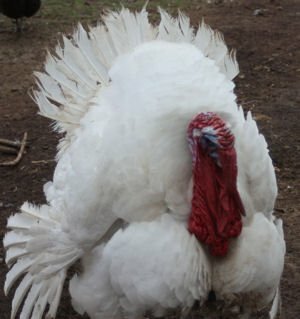 Posted in Livestock and tagged Giant White Turkey by TempestT-37 with 6 comments.